With a jackpot worth millions and some fabulous secondary prizes up for each draw, the South Africa Lotto is one game you simply cannot miss. It is South Africa’s favorite 6/49 game because it only takes matching those six main numbers from 1 to 49 to scoop the biggest prize in the game. The game offers players two chances each week to win the jackpot and the secondary prizes. The official draws for the South Africa Lotto are held Wednesdays and Saturdays at 21:00 SAST and you can even watch them live on TV on SABC2. 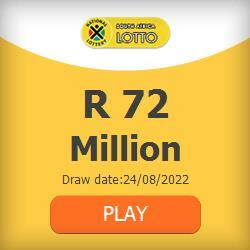 You can also check the SA Lotto results online right here! In case you haven’t tuned in to see the South Africa Lotto draw live on SABC2, you can always check your results on megamillions.co.za. After each draw, we make sure to post the winning numbers on our SA Lotto Results page. Here, you will also find the South Africa Lotto winning numbers for the previous draws in the game. Guessing the six main numbers from 1 to 49 will earn you the South Africa Lotto jackpot, which is worth 60.1% of the game’s prize pool. But there is also an additional number (also from 1 to 49) that is drawn for the South Africa Lotto. This number will determine the winners of the 2nd, 4th, and 6th prize divisions. The SA Lotto offers seven prize divisions, which makes it one game you simply cannot afford to miss. With each draw, the officials randomly select six main numbers from 1 to 49 and a bonus number. As we have mentioned above, players are required to guess all six of the main numbers to win the jackpot. Players who match five of the main numbers and the bonus number are eligible for the second prize, which is worth 6.5% of the South African National Lottery prize pool. The seventh-tier prize is the only one that has a fixed amount and it is worth R50.00. This goes to players who guess three of the main numbers.